One of my students was asking about an exercise written by a certain French pedagogue, Charles-Louis Hanon. 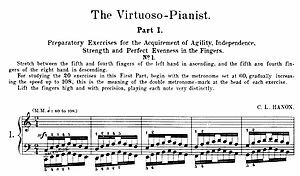 Pianists have played Hanon exercises for 150 years. Teachers assign them automatically, without much soul-searching. They have passed into the realm of unexamined truths: everyone else plays them, they must be good. Problem is, piano exercises are like penicillin. They can be wonder drugs or useless wastes of time or downright harmful. You only want to prescribe them as needed and only after careful diagnosis. Watch out! Piano exercises can be hazardous to your health. Use only under supervision and only as directed. Do not attempt to operate machinery like a piano while under the influence of this stuff. My student asked about one of these gems in her lesson book and I said, “For you, for now, no. It will just make you tighten up”. To my surprise she started singing, “We’re gonna tighten up. Let’s do the tighten up. Everyone can do it now so get to it”. I think Archie Bell and the Drells had a different idea about “tight” than I do. What do you think? Here they are with the Hanon theme song. § One Response to Tighten Up! And it is because you see the world like this that your students BLOOM. Besides, isn’t the phrase “tickling the ivories” all about that same idea, not “clutching at them and leaving clawmarks”? You are currently reading Tighten Up! at Piano Connections: The Studio of Megan Hughes.